When choosing the right bail bond company in Chatham, you might not know what to do other than simply pick the first name that pops up in your search online or that you find in your local phone directory. The reality is that while all bail bond companies may promise to do the same thing, they aren’t all alike. Choosing a bail bond company that is effective and works quickly is a must. Check out these top warning signs that you are working with the wrong bail bond company and make the switch to our talented team today. Being arrested is traumatic. No one wants to spend a second behind bars and when you are in this terrible situation, the last thing you want is for someone to pass judgment on you. The reality is that there are countless reasons you could wind up in jail and, in many cases, it isn’t even your fault. No matter what, though, you don’t deserve to be treated with judgment or condescension. If the bail bond company you chose is passing judgment against you or your family, pick someone else. You should feel the full support of your bail bond team and you should always be treated with the utmost respect. As the bail bondsman’s client, their priority should be your safe return home. Cut any judgmental bail teams out of the picture. Do you struggle to make contact with your bail bondsman? Are you calling at 2am only to find out they aren’t around during this late hour? A bail bonds company should be extremely easy to get ahold of and they should be available 24/7. You should never have to wait around for hours to find out more information from your bail team. Choose a bail bond company that puts your time first. They should be striving to ensure that you or your loved one get out of jail as quickly as possible. This means communicating clearly and not leaving you in the dark at any point in the process. Affording bail is near to impossible for most. That is why a bail bond is such an effective resource. You simply pay a percentage of the bail amount — usually, 10 percent — and the bail bond company posts the rest of bail on your behalf. However, in some cases, you can’t even afford the 10 percent due to a high bail amount. Don’t work with a company who simply shrugs and offers you no further help. A good bail bond company should have financing options and they should endeavor to find you a solution no matter what your current financial situation is like. Don’t waste your time with a team who won’t help you find a way to afford bail. Perhaps one of the most important things your bail bond company can be is efficient. You do not want to sit in jail longer than necessary. If you are posting bail on behalf of a family member or friend, you don’t want to make them wait on you either. 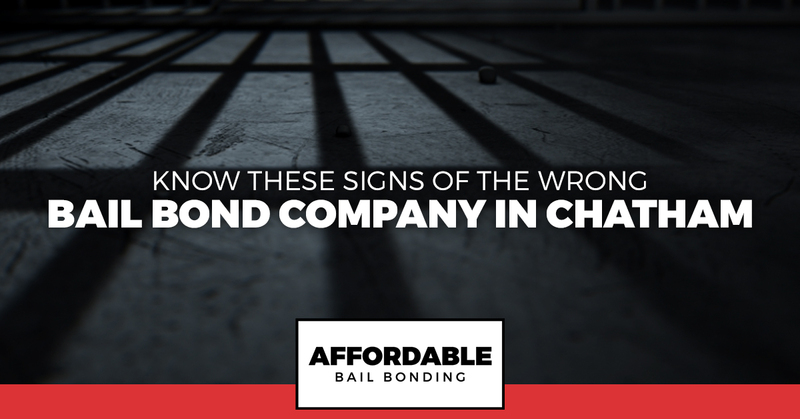 If your bail team seems to be dragging their feet or taking their sweet time getting things done, it’s time to find a new company with which to work. A good bail bond company will do everything in their power to make the process extremely efficient. They will help move you through the bail process quickly and they will post bail the first moment that they possibly can. If you are looking for the ideal bail bond company in Chatham, we invite you to reach out to our team at Affordable Bail Bonding. We provide fast bail and we offer our services 24/7. You never have to wait around on our efficient bail bondsman and we will always treat you with respect. Not sure if you can afford bail? We can still help. We work hard to make bail bonds accessible to anyone. Contact us night or day for further information about posting bail in Chatham.